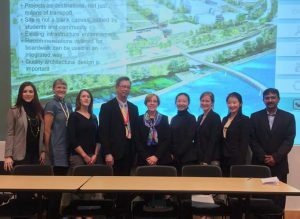 Seven graduate students participated in this Fall 2017 studio through the Edward J. Bloustein School of Planning and Public Policy to analyze two key elements for public access to the Raritan River as proposed in the Rutgers University Physical Master Plan – the RU 2030 Master Plan. The key elements explored were a new riverside boardwalk and a multi-modal bridge across the Raritan that would provide a more direct route from the College Avenue Campus to the Piscataway campuses. The studio explored issues related to the planning, regulation, environmental conditions, and public access around the two proposed projects. The students prepared a comprehensive report that analyzes these projects through mapping exercises, detailed characterization, public access goals and concepts to consider. At the end of the semester, the students presented their findings and recommendations in a public presentation attended by many regional stakeholders.